The original plan was that we were going to be doing a three-day trip around the Baltschiederklause, including climbing the Jägihorn; the weather forecast put an end to that. 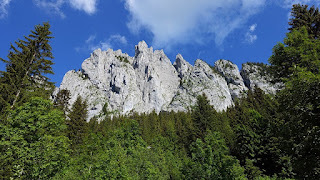 Since the forecast for Friday was good, the organizer switched to a one day tour: a traverse of the Gastlosen. Only one other person from the original group could make it, so there were four of us total. This tour isn't easy to do with public transportation (it's really impossible to do in a single day), so we go by car. After parking at the lot under Ober Gastlosen and Grat, we head along a path following the stream for a bit and then turn and climb up steeply to the Oberbergpass. This might be a fun path under normal circumstances, but the group was not moving slowly and the packs were heavy, so we were both mainly concentrating on breathing. At the pass we take a break to have a snack and put on the climbing gear and then start climbing. Andrea is climbing with the tour organizer and greg with the other participant. The climbing isn't especially difficult (mostly 4s), but the bolts are not close to each other and things are times quite exposed, so it definitely keeps us focused. After the most difficult pitch (steep and really worn; 5c+or 6a when climbed free, but nominally 4c with help; fortunately with closely placed bolts so using help is straightforward) we catch up to the pair in front of us and end up overtaking them at the Eggturm. Up here we put the approach shoes back on, descend steeply, walk around the Daumen, and then climb the Pyramide in the approach shoes. 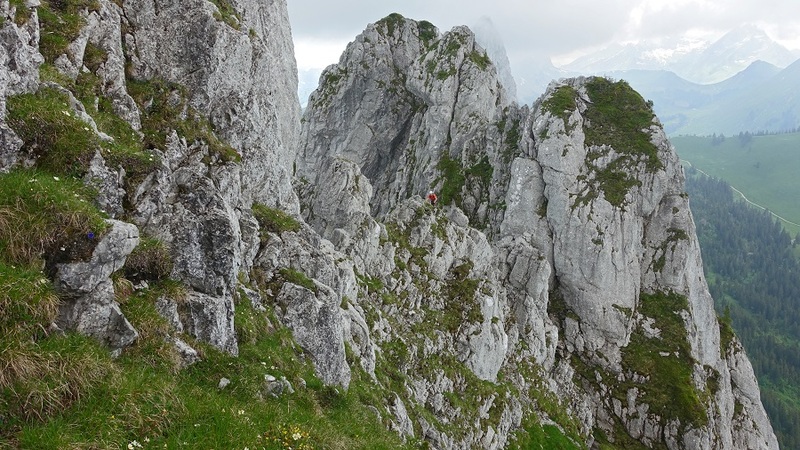 We do the descent to the next saddle by abseiling (you could theoretically climb down, but it's verrrry exposed), have a fun alpine-climbing-logistics situation at the bottom of the abseil, and then do a couple more pitches and some more walking to the peak of the Glattwandspitze. 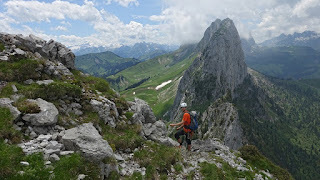 A short break to enjoy the views and eat a bit more, and then we abseil down to the next saddle. From here is all walking (though at times "interesting" walking) until we're on a normal hiking path along the last of the ridge. The path finding through this bit wasn't trivial and, even with the very correct sketch on the topo, I'm not sure we would have found the right way out without someone with us who had done it before. The last bit along the ridge is really nice, great views, plenty of flowers (too much stinging nettle! ), and good weather. Then down, down we go until we hit the "Chalet Grat" (basically a farmhouse with some rooms to rent). There we stop for a refreshing beverage in the sun with good views back along the ridge before heading down to the car and the long drive back home. All in all a great day of climbing. It was good to have done this with others and to learn from watching someone more experienced handle the challenges of alpine climbing.